You will understand Sirs if I do not stand on ceremony this morning. 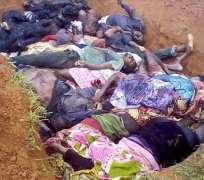 We lost too many people this weekend in Plateau State. Please be reminded that the primary purpose of your government is the security and welfare of the Nigerian people (Constitution of the Federal Republic of Nigeria, 1999, Chapter II, Section 14b). The Constitution you both swore to defend so solemnly before the God of Heaven, with Nigerians and the whole world as witnesses on 29 May 2015. We want you to succeed but you and your team have largely been unable to stand by this oath you took in 2018. Your administration has been unable to prevent mass killings of Nigerian children, women and men across the country especially in Adamawa, Benue, Nasarawa, Plateau, Taraba and Zamfara with other states not spared the brunt by terrorists and bandits. There are all sorts of technological tools such as drones, satellites etc. and a willing international community ready to support your team with anticipating and apprehending these terrorists and mass murderers and their funders. Why has your administration been unable to successfully deploy these tools and assets to find the killers of these Nigerians and their funders and why have we continued to daily lose Nigerian civilians, policemen and soldiers? The latest wanton killings of our children, sisters, brothers in Plateau over the weekend and other areas where there have been communal clashes demonstrates the glaring security failure for the whole world to see. And the killers continue to be emboldened. It seems as if for thousands of Nigerians who voted in this government, their reward has been death and untold suffering, hardship and loss of loved ones. You have variously told us that the killers are bandits, foreigners and mercenaries etc. How do you know this? Where is your proof? Who are they? Where are their funders? With all the intelligence at your disposal and the success of your Bank Verification Number programme, how come your administration has not followed the money and fished out the killer-funders while using all at its disposal to anticipate and prevent these attacks and keep Nigerians safe? If the heads of the responsible agencies are unable to do their job, you should have, as a matter of urgency sacked them and appointed those who could. Our police and army officers are suffering too. Has the Presidency become so inured to the loss of lives and the hundreds being displaced daily that it will not take urgent and radical steps to stop these killings? It is instructive that immediately a Major General in the Army was attacked by bandits a few days ago in one of our states, our security agencies swung into action, conducted air raids on the bandits' hideout and caught the alleged culprits. They even arrested their alleged funder. It seems that this administration is not committed and willing to urgently secure the lives of 'ordinary' and poor Nigerian citizens, civilians and lower-ranking security agents but will move swiftly to ensure justice for a high-ranking soldier. I do not begrudge the major general his protection - He is first and foremost human and Nigerian like all of us and deserves the best protection and justice available. I simply ask you to ensure protection and justice for ALL Nigerians - even the poor in the farming communities you swore to protect. If you are unable OR unwilling to do this job, why don't you resign? I may get insulted by all and sundry who work with you or think they benefit by associating with you or by those from your particular circles and tribes and religious affiliations. I may even be persecuted by your security agents (I sincerely hope they have bigger fish to fry and terrorists to catch but who knows with the show of shame we have seen at Unity Fountain Abuja as they harangue citizens asking you to Bring Back Our Girls?) but the question now remains Sirs, where is your humanity? Do the pictures of those poor children not move you to radical and urgent action? What use is your power if you cannot use it for good? If you are unable to secure the lives of the Nigerian people against terrorists, ask for help from our international friends and more boots on the ground. There is no shame in that. I have no power to remove you. Only God who allowed you into your leadership position does. It is my prayer that He will have mercy on Nigerians and if you fail to speedily arrest this situation, save our lives by sacking your administration from your positions of power by any way He deems fit before this country descends into outright anarchy and appointing more competent and willing people into your positions. Amen. If our Executive has failed in its job, when will you do yours and impeach them? Nigerians know you are not saints and we are dismayed by the political grandstanding and avarice displayed by many within your ranks even at this crucial time in our nation. What legacy do you each want to leave behind? I particularly wish to ask the Senators from the affected areas who have been quiet, especially my Senators George Akume, Barnabas Gemade, David Mark and the Senators from the other states which continue to suffer attacks, why do you remain silent? Thankfully, most of you are Christians and as you are my Elders and Uncles you know the Christian Scriptures better than I do. If you fail to speak up now Sirs, as Mordecai told Esther, God will raise deliverance for your people from other quarters. May God guide you and order your steps as you do what is necessary for the protection of your people. And if you wilfully fail in the discharge of this duty, may He remove you from your positions of influence and raise up others more willing and able to take your place. We know campaigns and elections are almost upon us and many of you aim to retain your positions. Please remember that you cannot govern dead people. As the Chief Security Officers of your state, I call on you to use the (in)famous security vote you all receive to protect your people. Please help support the police and other security agencies to carry out their duties. We know that our Constitution does not give you power over the Commissioners of Police in your states etc but surely, there must be ways to use this security vote and empower our communities by putting in place early warning systems which can help evacuate the areas before the attackers get there? It is my fervent prayer that God will give you wisdom and open doors to enable you better serve your people in this regard and if any of you are more concerned with winning elections in 2019 than ensuring the welfare and security of his people, may God speedily remove you and have your place taken by another who will better serve his or her people. Amen. Save our Souls. Please use your good office to influence whatever you can. And may our God order your steps. If there be any working against their people, may God Himself depose them and raise up Traditional Rulers ready to serve. Amen. Whether Christian or Muslim, when will you come together and speak as one? Whose voice is heard praising the Creator from the grave? What congregations will you have by the time all the churches, mosques and shrines are ravaged and desecrated and all the worshippers hacked to death? Please come together and speak with one voice. Demand better security and welfare. Please put pressure on our leaders to do the right thing by God who put them here and ensure our safety. May God enable you use your positions of influence for good at this time. None of you are safe. If the Shiites and Catholics and other Christians and Muslims cannot worship in safety and are being denied their fundamental rights to security today, what makes you think it will not be you or your own group tomorrow? Let us not be deceived, none of us are safe in this country. May God the Creator strengthen our bonds of unity and deliver us at this time from the failures of this administration. And may He guide you at this time. As you read this, you may be wondering, who is this person? Depending on your leaning and affiliation, you may be saying, how come it is now this writer is demanding the resignation of this government and saying these prayers? I am truly an ordinary Nigerian and do not hold any powerful position. I am simply human like you and cannot take this anymore. Your safety and mine are not guaranteed. And it has been so for decades - it has worsened under this present administration and unless you live in the centre of a major city, we are all in danger of being massacred by these terrorists, murderers and bandits. Let us not even talk about the kidnappers - many people we know have experienced that already. Question: are we an accursed people? Maybe we are. We will hear of the latest massacre, exclaim, forward it on social media and then go about our business even as terrorists continue to massacre our fellow Nigerians and gain more ground across the country. Our safe spaces continue to shrink. Our police and army officers have also been killed in numbers. And we are all standing by watching it happen. If we do not speak up now, there will be no one to speak up for us when the terrorists get to our various towns and villages and slaughter our children, sisters, mothers and fathers. I cannot work today as I think on those killed with such impunity in Plateau this weekend and will be calling for 3 days of mourning in my office. I urge those of us who can to do the same. Some of us who have not yet been touched by these terrorists may say all manner of things and continue to defend the glaring failures of this administration for whatever reason. I will say that may God show us all the same mercy we show the fallen and the bereaved in this country in due course. We remember our fallen children and sisters and brothers both civilian and non-civilian across Nigeria - in all the states of the Federation especially Adamawa, Benue, Nasarawa, Plateau, Taraba and Zamfara and pray God have mercy on their souls. May their deaths not be in vain. And may He heal their loved ones and bring the killers and funders of these killers to justice Himself. Amen. We have been together on different issues and continue to speak up. This work is thankless and tiring. We are often in danger as we go to different places to offer succour and relief. Our task would not be so enormous if our federal, state and local governments were doing their jobs well. Please let us not give up. It is darkest before dawn. Let us stand together like never before and insist on better welfare and security for the Nigerian people including our police officers and soldiers. Let us not be swayed and distracted by various obfuscations and dramas but keep our eyes on the prize - a Nigeria where we can all go to sleep safe from marauding terrorists and killers. If you are a Nigerian in diaspora, please write to your representatives and even the President of the country you are in and ask them to help the Nigerian people and free them from the shackles of this present administration. The world cannot afford a Nigeria in shambles with refugees all over West Africa and beyond. This is better imagined than experienced. May the God of Creation direct our noble cause. Your silence is deafening. Where are you at this time? Do you only come out when the price of fuel is about to go up? Have you been 'settled'? Or, like many Nigerians, have you been too impoverished by this administration's economic policies to focus and fight? A dead people cannot fight fuel price increases. Please remember that. I urge your leadership and you all to come together and speak for the Nigerian people in the way you have done in the past. This is not the time to roll over and play dead. May God give you courage as you do so. Amen. _O God of Creation, direct our noble cause, guide our leaders right, help our youth the truth to know. In love and honesty to grow, and living just and true, great lofty heights attain, to build a Nigeria where peace and justice shall reign._ Amen. Amen. Amen. God bless Nigeria and all the nations of the world.